This is an effective treatment for the elimination of cellulite. The patented seaweed mud wrap formula will stimulate, firm and tone the skin, giving it incomparably long lasting softness and elasticity. This intense cellulite treatment begins with specific massage techniques to stimulate the circulation, aid the breakdown of toxins and to remove dead, dry skin. The leg and thigh areas are polished using Guam Seaweed scrub to boost the circulation and encourage the detoxification process. Using cold exfoliating mitts followed by warmed mitts, the scrub is brushed away using fine pressure point strokes to help break down toxins. Guam Seaweed mud is smoothed over the legs and thighs which are then wrapped in cellophane film to encourage the absorption of the minerals into the skin. This is left on for 30 minutes as an intense treatment. After showering off the mud, the thighs and legs are massaged with Guam Strengthening Cream Gel to finish, leaving the skin looking smoother, more toned and supple. 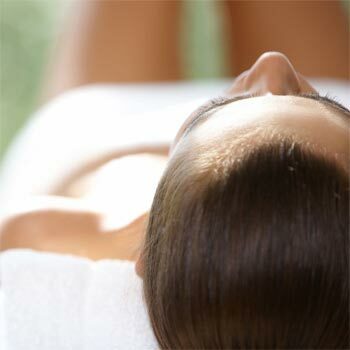 To achieve the best results a course of 6 treatments are recommended.